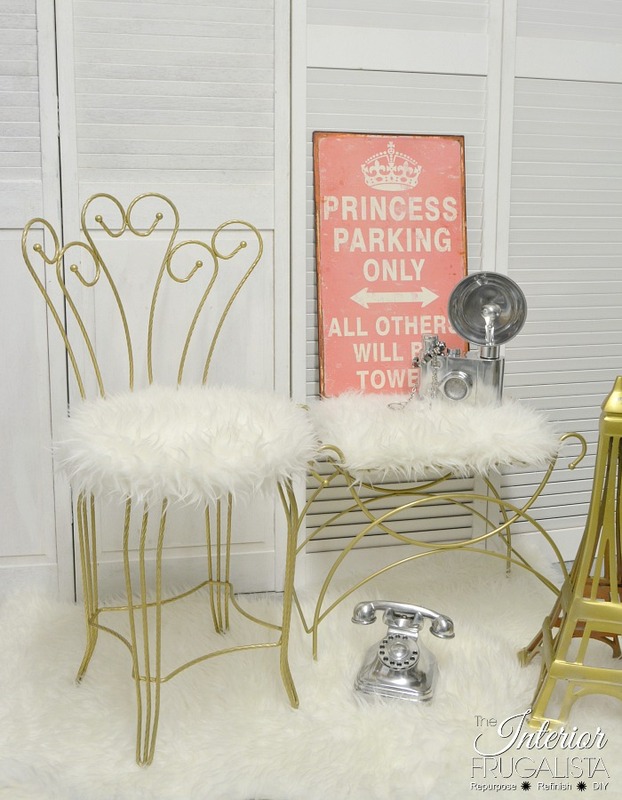 Rugs don't have to be just for floors. 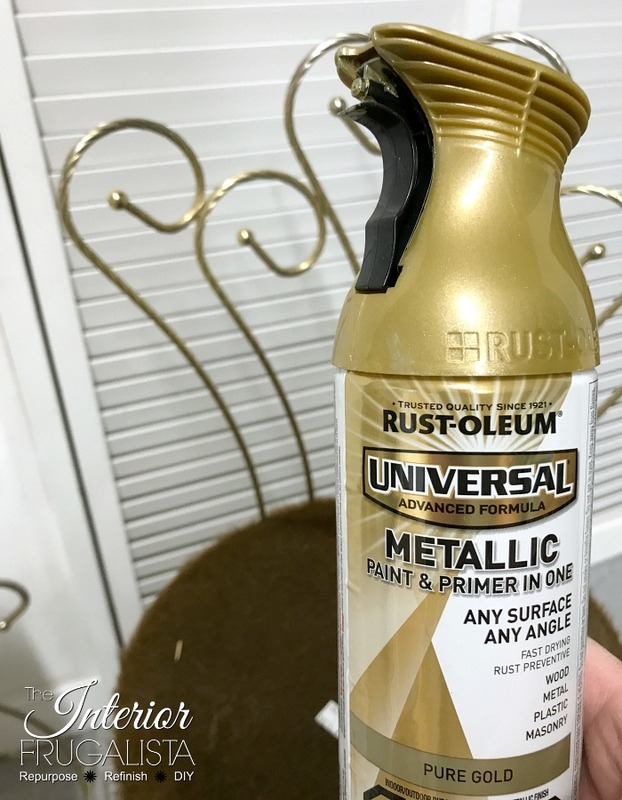 Have you ever considered using them to upholster furniture? 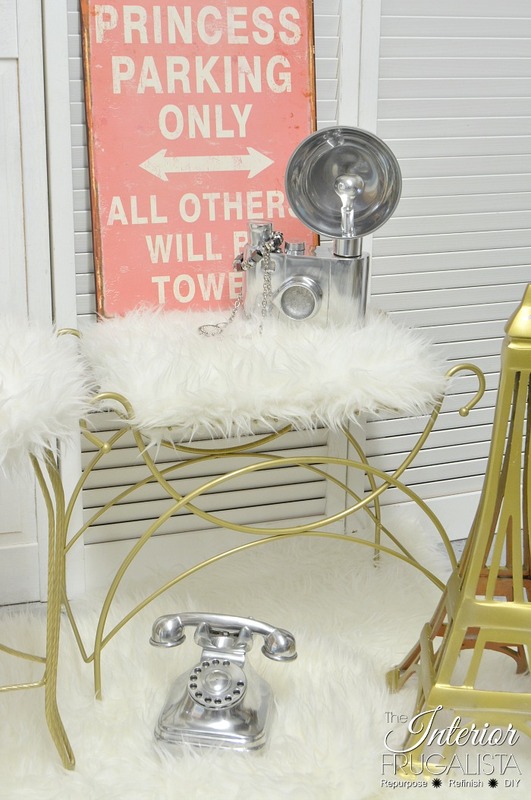 An inexpensive faux fur rug is a quick and easy way to add instant glam to vintage vanity stools. 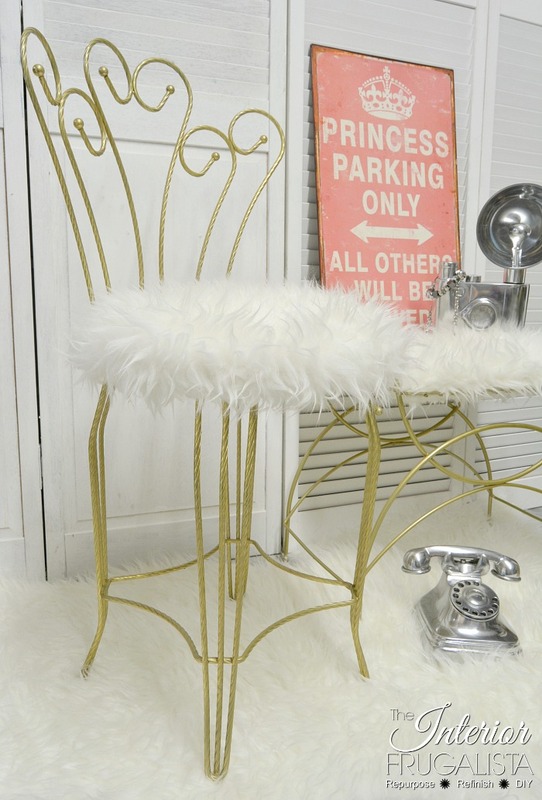 It only took an hour and less than $40 to transform these metal vanity stool and chair. 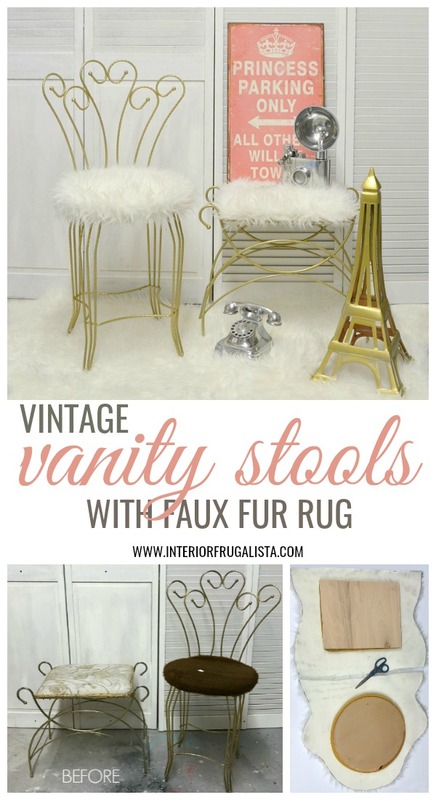 Rarely does a vintage vanity come complete with the original stool and so I always have my eyes open for vanity stools and chairs to keep in my stash. 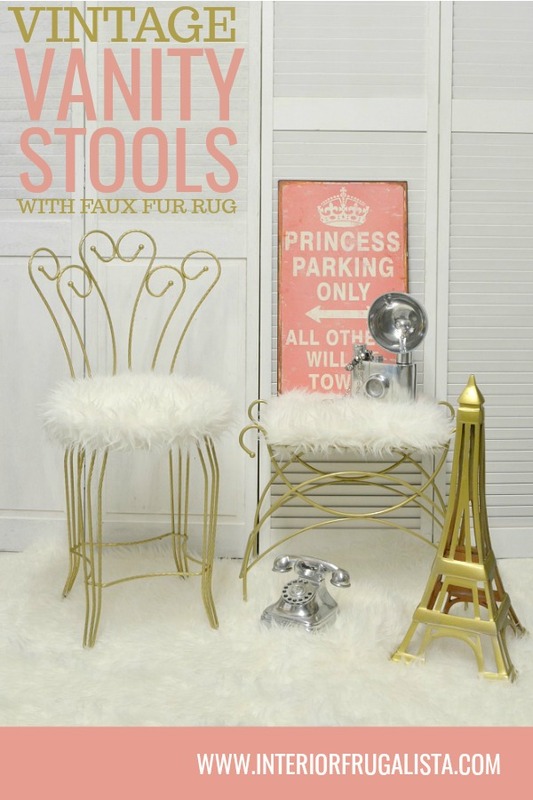 I found both of these, a vanity stool and chair for less than $20 but oh were the seats nasty. It took around 30 minutes to refresh them with paint and another 30 to upholster the stinky seats after a trip to IKEA. 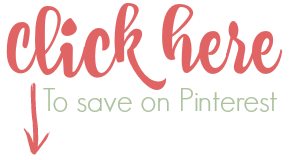 I've included affiliate links for your convenience so you can see what products I used or recommend for this project. What that means is that if you click on one of the product links and make a purchase, I may receive a small portion of any sales at no additional cost to you, which supports the costs of running this site. See my full disclosure policy. This is what they looked like before with the dirty stinky seats. What an improvement wouldn't you say? 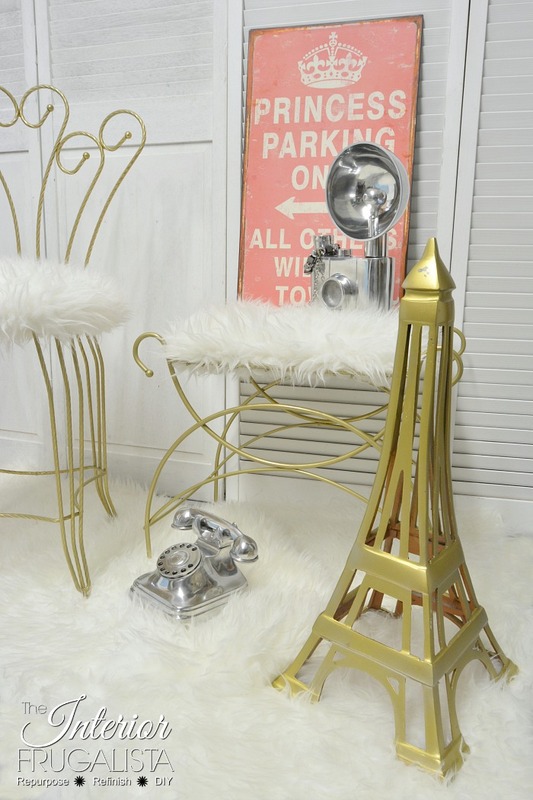 The gold was worn down to the metal in some areas on both stools but nothing a little spray paint can't handle. 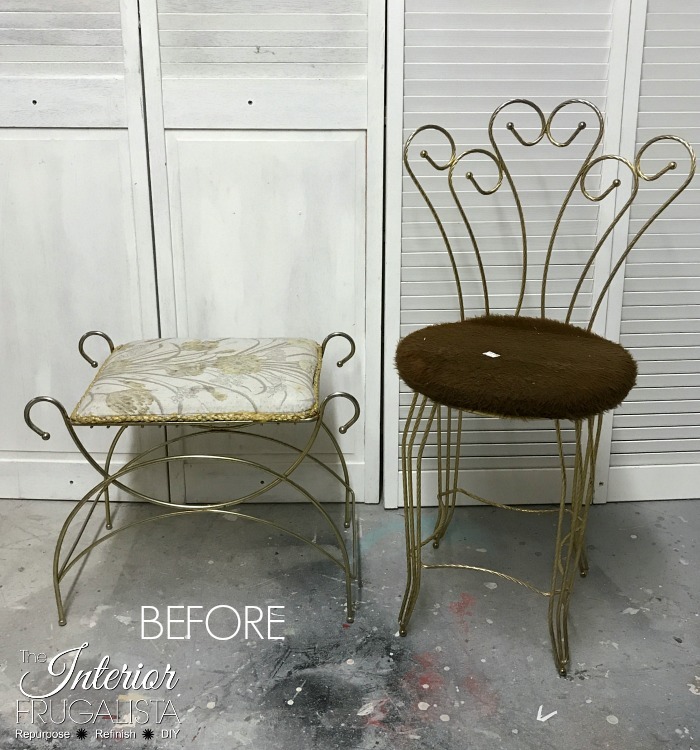 After removing the seats and giving the metal frames a bath in warm soapy water, they were painted with Pure Gold Rust-oleum Metallic Spray Paint. While the first coat was drying I got busy removing the nasty fabric from the seats. Then I did battle with a Tejn and I won. One IKEA Tejn rug covered both of these stools for under $15. Can't beat that! While the second coat of gold paint was drying I got busy upholstering the seats. 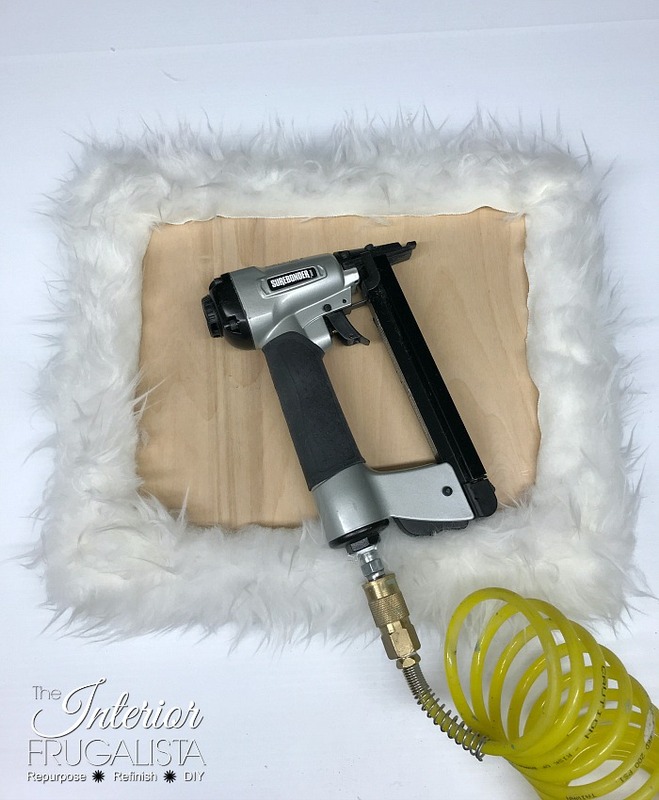 The fur was stapled to the seat with a pneumatic staple gun. Place the wooden seats face down on the underside of the rug (as pictured above). Measure a 3-4 inch fold allowance and cut accordingly. Thicker fabrics are more difficult to work with but I provide some helpful tips below. Add one staple to the center of each side, pulling the rug taut before each staple. Work your way around the seat towards the corners, stopping around 2-3 inches before the corner. On each corner take the point of the fabric and fold it up like a flap over the corner. Staple along each side of the flap at a 45-degree angle. You should have fabric sticking straight up on both sides of the stapled flap. Trim excess fabric with scissors and staple it down with as little bulk as possible. Use a straight edge to trim fabric around the seat with either scissors or a utility knife. 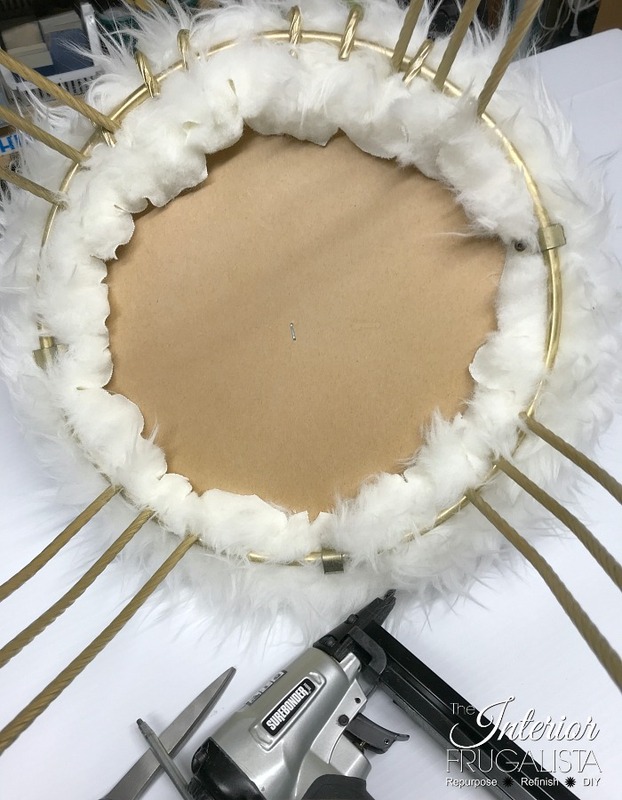 Snip small 1-2 inch wedges around the circle along the outer edge (no further than the 3-4 inch fold allowance) to help relieve bulk when stapling. Using a clock dial as a visual, staple the rug at 12. Pull the rug taut and staple at 6. Repeat at the 3 and 9 points. Continue to pull the rug taut as you work and staple between the previous staples. Work your way around the seat overlapping the wedges to relieve any bulk. 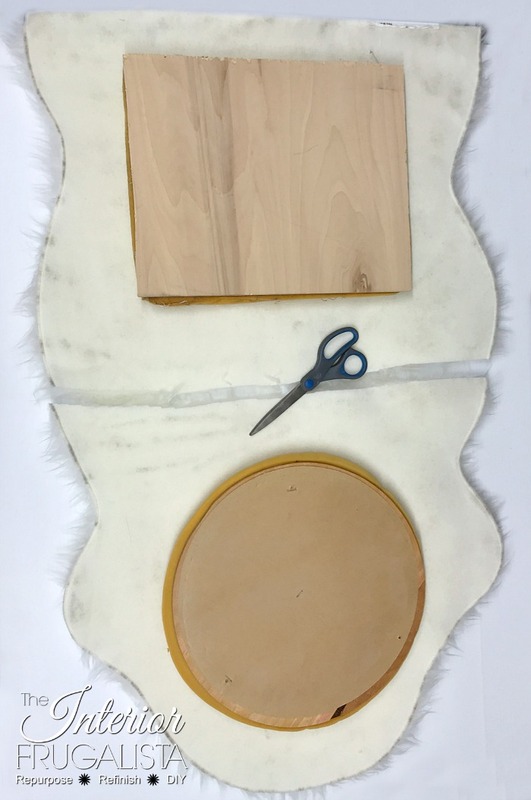 Trim the excess fabric with either scissors or a utility knife before attaching the seat to the frame. Pictured below the bottom half of the seat has been trimmed and the top still needs trimming. 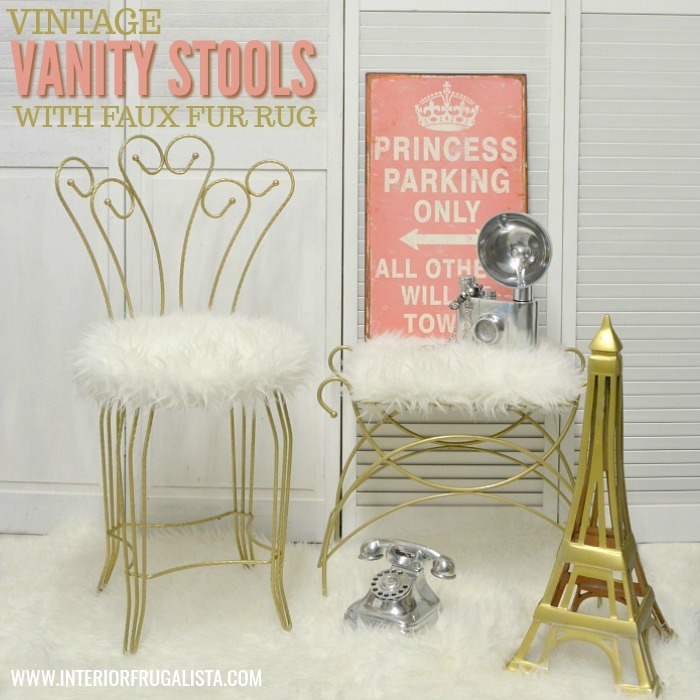 What an improvement a can of paint and a faux fur rug made on these vanity stools. 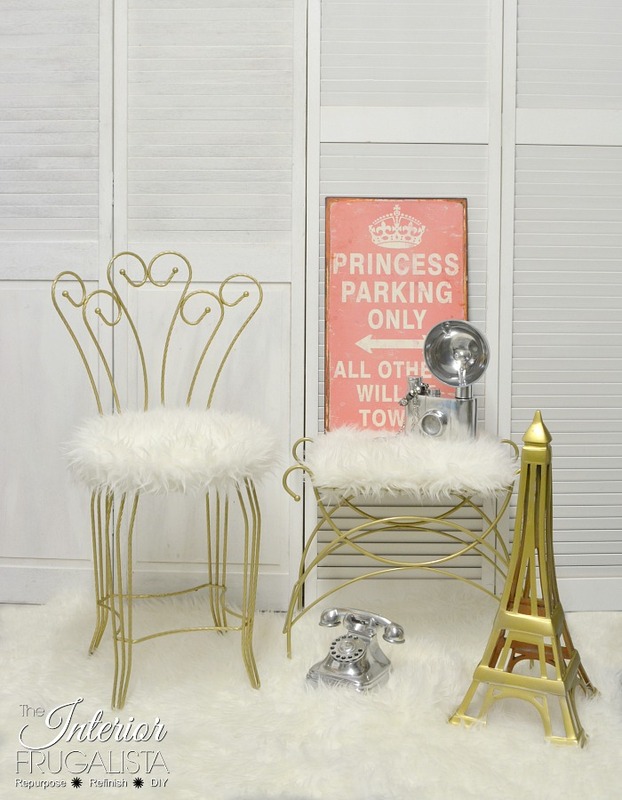 For under $40 a stinky old vanity stool AND chair get a glam makeover fit for a princess. 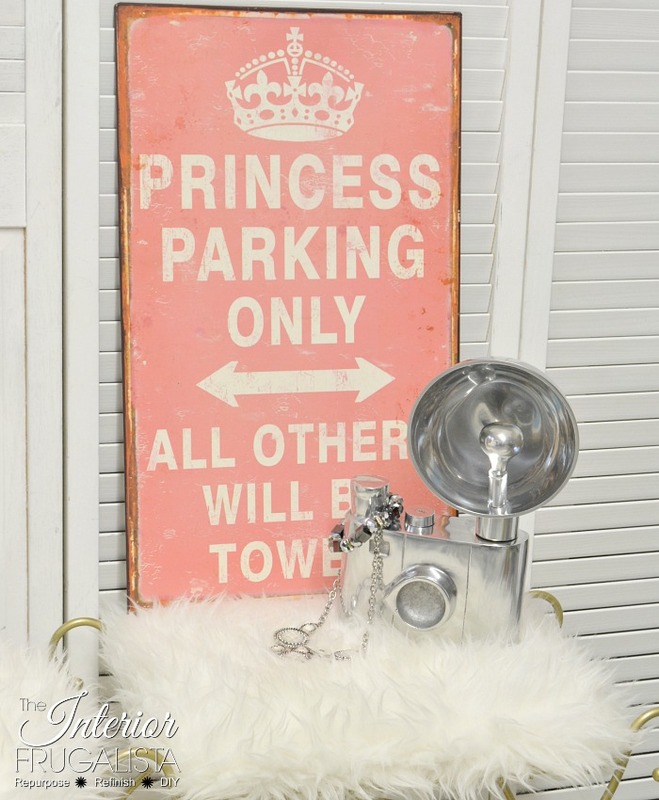 Now they each need a vintage vanity and finger's crossed I'm successful on my hunt soon. They are hard to come by in these parts. 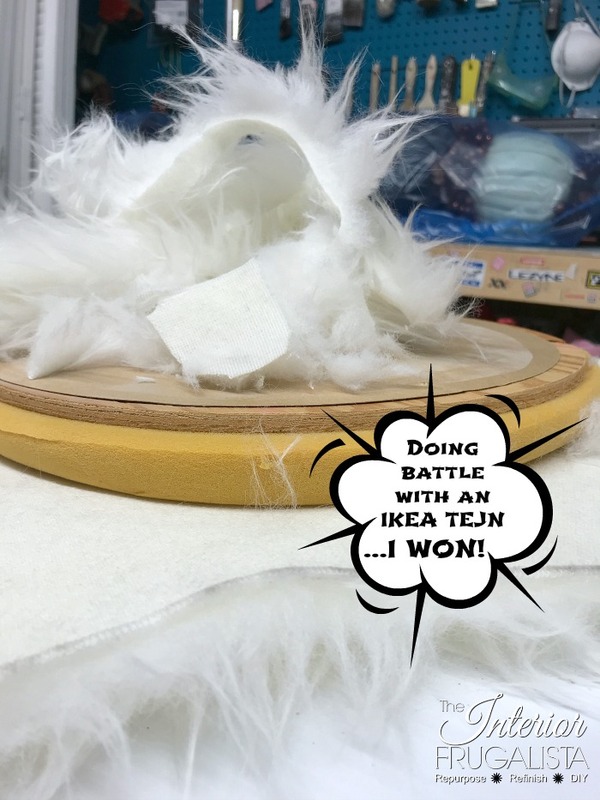 Have I inspired you to rethink the IKEA Tejn Rug? 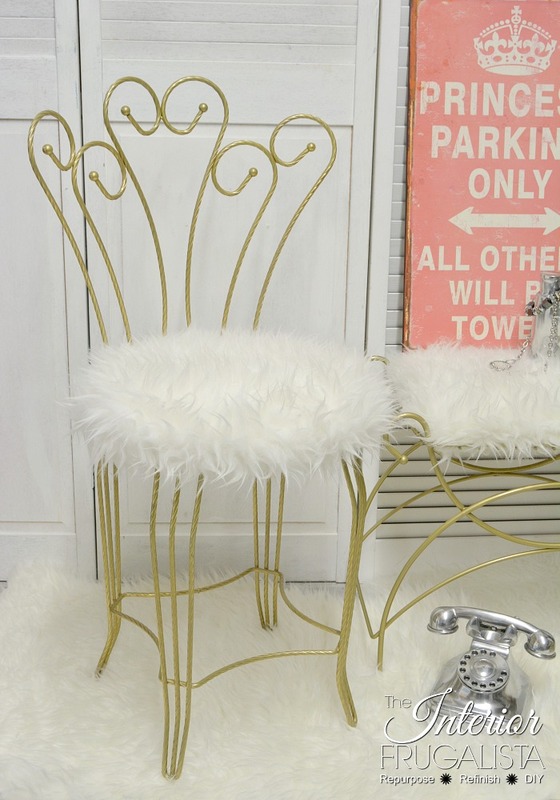 Do you have a vanity stool or chair that could use a makeover? If you do and have any questions, leave them in the comment section below or press the Contact Me button at the top of the blog to send me an email.